You will see the Add Function dialog where you should enter function properties. Click OK. Now you can insert the newly created variable in the XML code of subsequent requests. to get the content of Value node from this XML document. In this example, there are 2 properties inside the <properties> node. 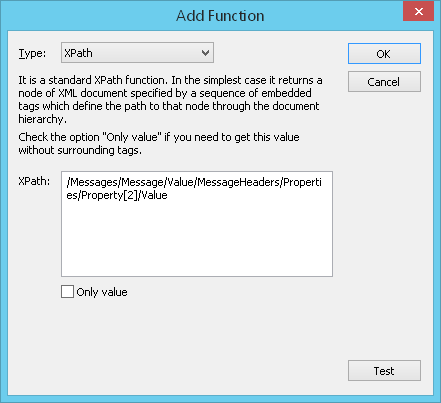 If you want to select the first property, you should specify Property in path expression. To select the second property, specify Property. You can test the work of $XPath function by clicking the Test button. You will see the result of function work on the basis of recorded server response (received during the recording process).